A busy offseason has left Brooklyn Nets fans hoping this year is THE year. The Nets have been rebuilding for some time now, but after being able to replace two big names that didn't pan out with young talent, fans are driving demand up. 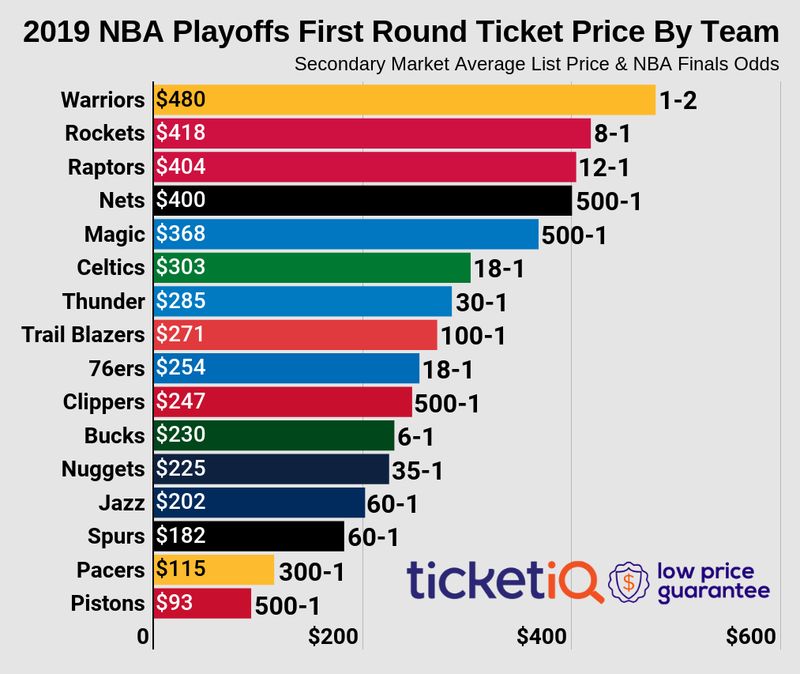 The average asking price on the secondary market for a 2018-19 Brooklyn Nets ticket is up nearly 16% compared to last season. 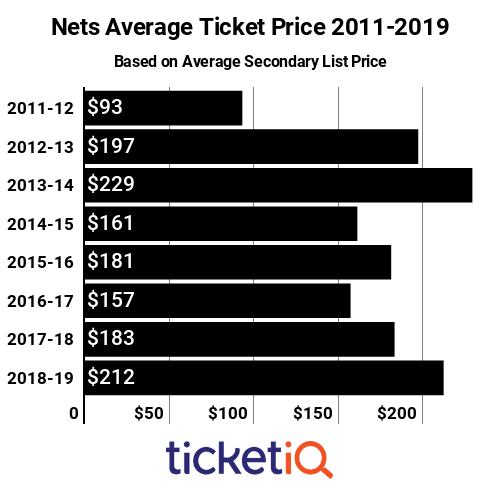 Below is how Nets tickets stack up on the secondary market over the last decade. Brooklyn tickets are the second most expensive of the decade, behind only 2012-13, the season the Nets moved from New Jersey. 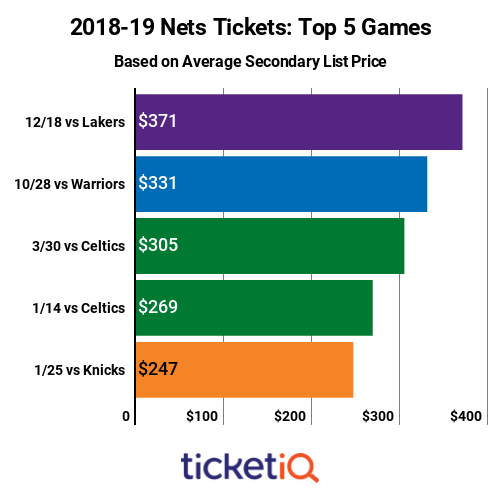 The average price of a Nets ticket is $212, making it the sixth most expensive in the NBA, up from No. 11 in 2017-18. The Golden State Warriors are ranked No. 1, with a $463 average asking price. Nets season tickets are available through the team, and can be purchased in full- and half-season packages. In addition, there are several ticket packages that include food and access to other Barclays Center events. Single-game tickets are available through primary market partner Ticketmaster, though some games, including the October 19 home opener against the cross-town rival New York Knicks and the October 28 Warriors game, are already sold out. TicketIQ.com has secondary market tickets available for all games, including the home opener. For that game, fans can choose from seats high above the action in Section Level 230 starting at $81 or closer to the action behind the net in Section Lower 16 for $2,565. Both sets of tickets come with the company's Low Price Guarantee. The October 28 Warriors game is the second most expensive of the season behind the December 18 Los Angeles Lakers game. The Lakers game, which will mark the LeBron James' first visit to Brooklyn as a Laker, checks in at $381, while the defending NBA champion Warriors are commanding $331. The next three most expensive games are against the Atlantic Division rival Boston Celtics -- $305 average asking price for the March 30 game and $269 for the January 14 game -- and the January 25 matchup with the cross-town rival Knicks, which is trending at $247. The Nets haven't made it to the playoffs since 2014-15, so if they get off to a solid start or are in the playoff picture late, expect the prices for all of these games to rise.